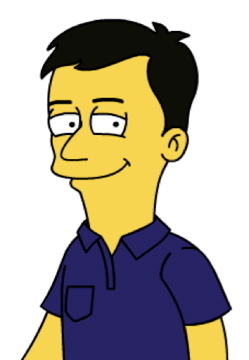 Part of the marketing campaign for the Simpsons movie is a website called SimpsonizeMe.com. You go there, upload a photo of yourself, press a button here, turn a dial there, and after a minute or two, you’ve got a yellow, four-fingered, bug-eyed picture of yourself. Then, if you think the computer didn’t quite capture your essence, you can tinker with the image. I couldn’t find a scowl among the smiles, so there you go. Also, the pocket’s on the wrong side and the face is symmetrical. Posted in 2007, Uncategorized on July 27, 2007 by VDV.